" There are many types of scalp conditions and related problems that can cause symptoms such as itching, flaking and hair loss (alopecia). There is no known cause and no cure, just methods for controlling symptoms. Scalp problems such as mild flaking are referred to as dandruff, with yellowish scaly and greasy scaling or flaking referred to as seborrhea or seborrheic dermatitis. In babies, the condition is referred to as cradle cap. The primary cause of skin cell flaking is dry skin or excess sebum production from the sebaceous glands, which are found on the scalp, face, and armpits. The substance secreted causes the flakes to clump on the skin, causing them to fall off in larger, more noticeable batches. It is not a reflection of poor personal hygiene unless a person infrequently shampoos. Many cases of seborrheic dermatitis have the presence of a fungus called Pityrosporon ovale. Silver scales are a symptom of psoriasis, which is often mistaken for seborrhea. Seborrheic dermatitis results in the most intense itching and symptoms. In adults, treatment starts with over the counter dandruff shampoo. If the condition is unresponsive, a visit to the Doctor is necessary." An itchy scalp can be caused by any of the scalp conditions listed below. In most cases it is caused by a yeast (pityrosporum) found naturally on the skin that is attracted to the dead skin cells on the scalp. Most of the time itchy scalp conditions can be controlled with an anti-dandruff shampoo that contains ketoconazole. Scalp itch and dandruff can be treated by washing the hair 2x during the morning shower. The first lather and rinse is to remove dead skin and the second will help to kill any yeast buildup. One recommended product is Nizoral A-D Anti-dandruff shampoo. Psoriasis: Indicated by the presence of skin plaques (thick, scaly skin). Allergic contact dermatitis: Commonly indicated by red skin patches that are clearly demarcated. May or may not have skin scaling. Indicated if you have recently tried a new skin topical or shampoo. Seborrheic Dermatitis: A condition where the thin scales are fine, scattered and white, with or without red skin irritation (erythema). Ringworm (tinea capitis): A condition which as a specific area of the scalp which is being affected, and is irritated and red (erythematous). The condition can appear in African Americans as seborrheic dermatitis. 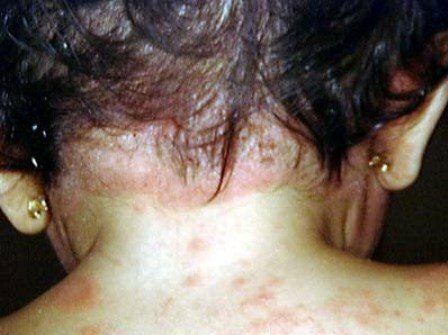 Discoid Lupus Erythematosus: A condition where there are elevated flat-topped plaques along with plugged hair follicles. Prurigo Nodularis: Scalp irritation accompanied by elevated plaques or papules (bumps and pimples). Actinic keratoses: Scaly and rough papules or papules that are red or yellow on red irritated skin. Seborrheic keratoses; Black macules (small circumscribed changes in skin color that are either depressed or raised) or waxy tan-grown macules. Look like they are "stuck" to the skin. Tinea amaintacea: Yellow-white skin scales that are oval and large. They may appear to be warts that are stuck to the hair or scalp. Seasonal Scalp Itch: Unclear cause that can be caused by dry scalp, humidity, hair care products, oral medications, metabolic disorders or poor hygiene. It can also be caused by work headgear, hairnets, sports helmets. Younger patients are often undertreated for scalp dermatoses (1). Dr. Steven Mandy discusses the cause and treatment of dry scalp. Dry scalp and dandruff are not the same condition. Dry scalp is caused by dehydration while dandruff is caused by excess oil production. To treat dry scalp, the scalp needs to be hydrated with a conditioner and mild shampoo. Dry scalp is uncommon, with white flakes probably being caused by dandruff. Dr. Sandra Lee discusses the causes and treatment of dandruff. Sebaceous glands secrets oil which escapes the skin through the hair follicles. The secretion contains flaky hair scales which are called dandruff. Severe dandruff is called seborrheic dermatitis. When the sebaceous glands produce excess sebum or oil, the flakes build up on the scalp before falling, and then fall off in a larger quantity. This creates the appearance of white flakes in the hair and shoulders, prompting treatment. An oily scalp occurs when the body is producing too much oil due to a hormonal imbalance, such as during adolescence. A mild case of dandruff is the natural way the scalp eliminates dead skin cells. It is a reaction to normal yeast that we have naturally in our skin. For some unknown reason, in some people or in others at some particular time, the skin cells die off faster, causing dandruff. Washing your hair more can help dandruff. It will not dry out your scalp. In some people, Dandruff can be triggered by medications used to grow hair such as Rogaine (minoxidil). Dandruff is rare before puberty because the sebaceous glands are still immature. Doctors are not entirely sure what causes dandruff. It is believed that the yeast or fungus Malassezia might be the cause. Genetics plays a role such how hairy you are and how oily is your skin. Humid or dry environments can impact dandruff. You are treating the scalp, not the hair, with a dandruff shampoo so be sure to massage it in well. Wash your hair more often not less to remove the greasy scales that are dandruff. The more often you wash (1x a day or every other day), the less dandruff you will have. In babies, a natural product such as Cradle Cap Treatment Scrub can help soothe and moisturize dry skin. Cradle cap often goes away on its' own. Sometimes people think they have dandruff and they have another medical condition. Some people think they have dandruff, but they really have a condition such as psoriasis. Tinea capitus (ringworm) is also mistaken for dandruff. If an over-the-counter dandruff shampoo isn't working, see a Dermatologist. Green tea will naturally exfoliate the skin without dehydrating the surface. Take 1 cup of hot water and steep 2 tea bags (20 minutes to all night). After it has cooled, massage liquid into scalp. Thyme has antiseptic properties. For 10 minutes boil 4 heaping tablespoons of dried thyme with 2 cups of water. Let cool and then pour half over damp hair. Massage in the liquid. Do not rinse. Use rest the next day. Warm several ounces of olive oil. Wet hair and then massage oil into scalp with a cotton ball or brush. Cover hair with shower cap and leave on for 30 minutes. After 30 minutes wash out the oil and follow with a dandruff shampoo. A more severe case of dandruff is referred to as seborrhea. When a scalp is oily, but not itching, crusty or inflamed, then the condition is called seborrhea. Seborrhea refers to the overproduction of sebum, an oily substance manufactured by the sebaceous glands. When itching, crusting skin and inflammation is involved, then the scalp problem is referred to as seborrheic dermatitis of the scalp. A Doctor may also prescribe a corticosteroid for severe cases. Like other scalp conditions, anti-dandruff shampoos are used every other day and then 2x per week until the condition is eliminated. Follow the manufacturers or your dermatologist's directions. If your condition does not respond to over the counter treatment, be sure to see a doctor as it could indicate that a prescription product is needed, or that there is a systemic underlying cause such as diabetes. 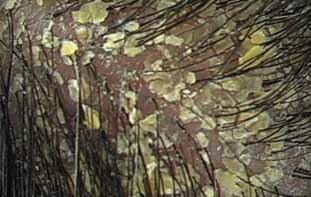 Scalp condition seborrheic dermatitis, which is characterized by large yellow greasy scales that form skin crusts. Seborrheic dermatitis scalp conditions appear similar to and should be differentiated from psoriasis (does not affect areas beyond the hairline), impetigo (skin lesions are in one area and related dandruff is not greasy), Pityrias rosea (have a distinct skin patch appearance that looks like a hub and spokes) and T. Cruris and corporis (not greasy, caused by a fungus that can be determined with tests. 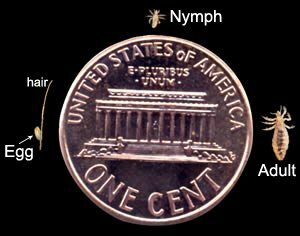 Hair lice are caused by insects (adults are 2-3mm in length) that feed on a person's blood. They are primarily found on the scalp. Lice and their eggs (nits) can also be seen on an infested person's clothes. Lice are only spread by crawling from person to person after close contact (they do not fly or jump). Lice can be seen with the naked eye but are difficult to find. Use a fine-toothed comb combined with the help of a flashlight and magnifying glass. If lice are found, check everyone living in the same home as this is one of the scalp conditions that is contagious. If you share a bed with another person, that person should be treated along with the person with the lice. All items used by the infested person should be washed in hot water and then placed into the dryer (need temperatures of 123F to kill lice and Nits. Lice can be treated with products that are available with and without a prescription (called pediculicides) . Over the counter products available for removing hair lice include RID and Pronto (active ingredient piperonyl butoxide). You can also use a chemical and pesticide free, non-toxic natural lice remedy such as Naughty Nits. Regardless of the scalp lice treatment selected, follow the manufacturer's directions. You can download these lice treatment instructions (PDF Download) developed by the U.S. Centers for Disease Control. Scalp ringworm is caused by a common scalp fungus. There are three fungal types that cause scalp ringworm. The condition is also referred to as non-inflammatory and inflammatory. It causes symptoms such as bald patches/scalp hair loss (alopecia), dark skin pigmentation, itch, redness, and scaling. The same class of fungus can cause, athletes foot, jock itch, and rough toe and fingernails. The infection is spread from person to person or can be spread by pets. Scalp ringworm appears 4 days to 2 weeks after exposure. Doctors treat scalp ringworm with Griseofulvin (preferred) along with terbinafine, fluconazole and itraconazole. Treatments lasts for 8 weeks or longer depending on how the patient responds to treatment. Family members are frequently treated to prevent any re-infection. No matter which of the scalp conditions is causing the problem, be sure to see a Doctor if it does not respond to over the counter treatments. Scalp Psoriasis is characterized by scaly, raised, red patches called plaques. Symptoms include an itchy scalp, but not painful. Psoriasis is characterized by silver-gray plaques at the edges of the hairline and areas that contain hair. It may or may not be itchy. In some cases it can cause hair loss. 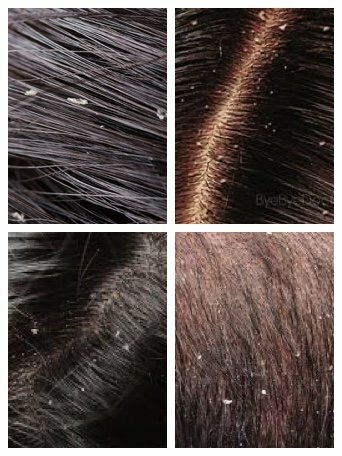 The condition needs to be differentiated from dandruff and seborrheic dermatitis, particularly when the psoriasis is in early stages. If scratched scalp bleeding can occur. It occurs in 50% of people with psoriasis. Treatment of scalp psoriasis is challenging for medical professionals. A combination of tar shampoo, salicylic acid and topical corticosteroids may be used. Treatment is made difficult by hair acting as a barrier to the penetration of ointments and creams. In rare cases the condition can resolve with no treatment or it can last for a long period of time. Vitamin D preparations are sometimes used instead of corticosteroids if a patient cannot tolerate these types of medications. If hair loss occurs then additional treatments such as cyclosporine or methotrexate may be used. There is no need for embarrassment when visiting a barber or hairdresser since most professionals will be familiar with the disease. To learn more about scalp psoriasis visit the Papaa.